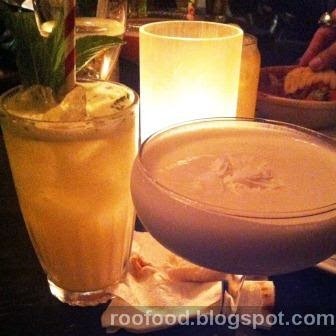 A long time favourite hangout, particularly for cocktail hour on a Saturday night evening has to be The Clock Hotel at Surry Hills. I love the old hotel with its first floor verandah wrapping around the sides and overlooking Crown St. The Clock is usually our first stop on a night out. Always plan to get there before 6pm happy hour starts as it lasts only an actual hour (no pun intended). 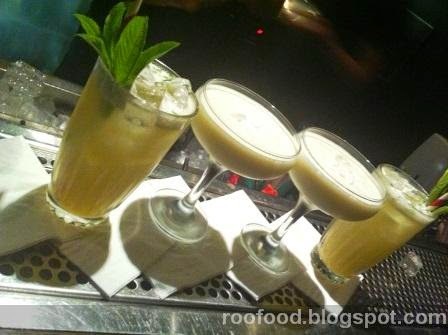 So with international guests visiting Sydney it was the first place I thought of when we talked cocktails. What I love about the cocktails here is that they are freshly made to order, regardless of the lengthy 5 deep lines waiting to order, there are varied so offering a taste for everybody'se taste whether you are fruity or creamy cocktail drinker and they are good portion sizes. It's been awhile since I have been to The Clock and I noticed that the cocktail menu had changed. There are many new cocktails to choose from and I do note it's missing a favourite berry cocktail. But that's okay...mixes things up (so to speak) and makes me try some new concoctions! Usually cocktails are in the $17 price range. Happy hour they are $9.50 making them one of the best venues for cocktail happy hours in the area! The Ginger Roger is made with Plymouth gin, fresh mint, gingerbread syrup, fresh lemon with in-house ginger beer and definitely the favourite of the evening. It is tangy with lemon and the heat of the ginger really spices this up. The Clocka ‘Colada is made with Havana Club 3yr, pineapple juice, fresh lime, peach bitters & Messina coconut sorbet - yeah you heard me right....Messina coconut sorbet from across the road! Yippee! Cocktails need nibbles and we select a couple of dishes to share. 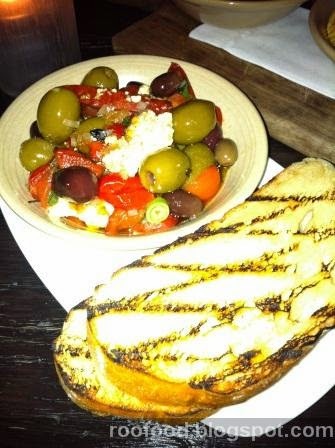 The olives, chorizo, piquillo, feta, PX with charred bread is served warm and always a winner. The charring on the bread gives the lightly toasted dough another flavour dimension but the bread to olive mix ration is amiss...and we definitely should have got ourselves a fork or spoon to actually pick up the olives and other goodies...instead of using our fingers (lucky we are amongst good friends!). 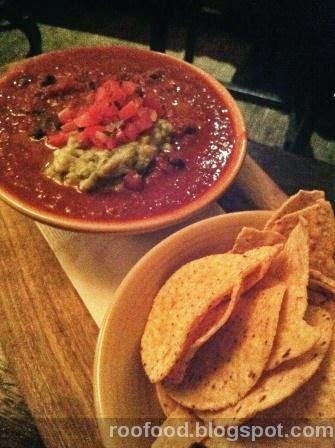 The other dish we nibble on is the chill pork hot pot, guacamole, salsa served with corn chips. This is seriously a meal in itself. The chilli is flavourful, spicy and meaty. Not on the menu but a classic all the same - a Bloody Mary and this was epic. Not only was it a well balanced with spicy kick Bloody Marty it was garnished with an egg, stuffed pepper, twiggy stick and Brussels sprout! Impressive!! Happy Hour is long gone and we have had quite a few cocktails. We find ourselves moving onto another drink, something my dear friend has introduced me to (and can say I will continue to drink). 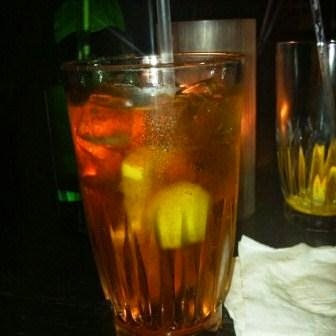 It's a very old fashioned drink that seems to have come back into style (like so many have). She had to give instructions and the recipe to the wonderful bar staff who gladly put it all together for us. It's called a Spritz. A glass of prosecco, a splash of Aperol an orange slice and an olive. This classy apertif originated in Venice in the 1800's. It's citrusy and sparkly and the olive adds a surprisingly salty edge to it that works. I do apologise for the most unglamourous food blogger photo! Let's just say that I probably shouldn't have been operating any form of machinery at this point in the evening. hahahah! We find we need some more hearty sustenance. The alcohol consumed was starting to have some effects. 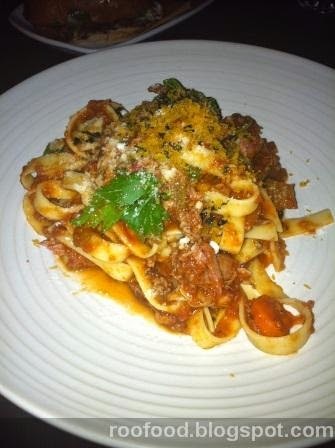 Mr Fu goes with the pappardelle, lamp shank ragu and gremolata dish, which he devours and loves the flavours. Mrs Fu and I decide to have a mini Cuban slider each (and to share) (which turns out to be on the larger side of a slider) We share the prok belly and pickled cue and the salt and chilli crab with romesco. Both are everything you want them to be after hours of drinking!! Pork belly is always good for the soul. The buns are soft and doughy. I always love this hotel and I know that I will be back soon! 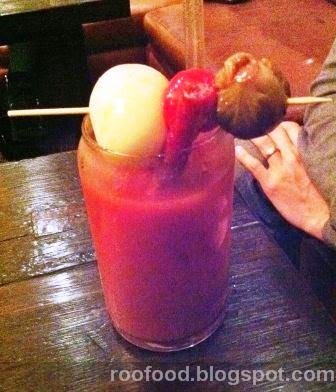 Ooh I want an epic bloody mary! 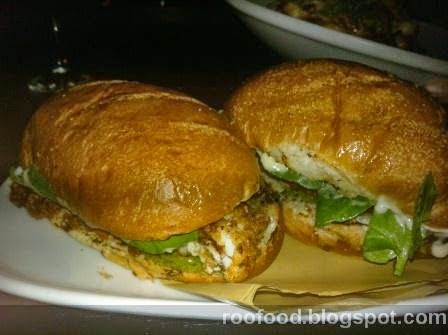 And those Cuban sliders must have gone down a treat after some alcomohol.